Dr Greg Williams, who was born and raised in Kingston, Jamaica but currently based in London, is preparing to take on the From Fire to Ice expedition on the coldest, windiest, highest and driest continent on earth, Antarctica. The expedition involves a great deal of medical research– daily tests and data collection. As the expedition doctor, Williams’ primary aim is to keep Rob Small, former Director of the Burn Centre in London, and the other members of the team safe – looking out for the early signs of hypothermia and frostbite. We had the opportunity to connect with Dr William to learn more about him, the expedition and what led him to participate. See written interview below. Where were you born, raised and based before heading to Finse, Norway? I was born and raised in Kingston, Jamaica but am currently based in London, UK. My family live in Jamaica, and I was last there in April 2015 celebrating my 50thbirthday with friends and family for a week of activities ranging from rafting on the Rio Grande to hiking up Blue Mountain Peak. We see that you bear the title Dr, could you please informed us on how you earn the title. Did you study/practice in Jamaica? I studied medicine at UWI, Mona campus and went on to train in surgery in the Britain, becoming a Fellow of the Royal College of Surgeons of England. I specialised in Plastic Surgery, subspecialised in Burn Surgery and was the Director of the Burn Centre in London when Rob Small was repatriated from Zanzibar, barely alive, with his major burn injury. What led you to participate in the ‘From Fire to Ice expedition’? After Rob had left the hospital, he received financial support from the charity Dan’s Fund for Burns. When he recovered, he decided that he would like to ‘give back’ to the charity but wanted to more than what most people do to fundraise. He was determined to walk to the South Pole – a dream he had before he was injured and thought he would never be able to do again, especially since he had to learn to walk again after his long stay in the Intensive Care Unit. Not only does he want to achieve his personal ambition, he also wants to inspire others affected by adversity to follow their dreams, goals and aspirations. I am the Medical Trustee at DFFB and Rob is now an ambassador for the charity so we got to know each other outside of the hospital environment. Not only was I Rob’s burn surgeon, but we had also become good friends so I was very honoured when he asked me if I would be the FFTI Expedition Doctor. What are your thoughts about From Fire to Ice expedition and are you excited? 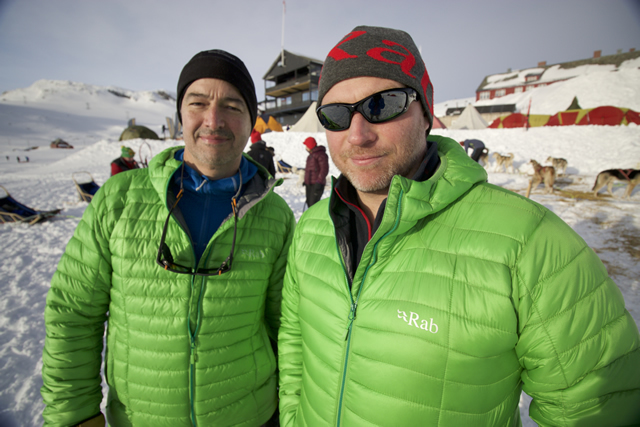 My primary aim on the expedition is to keep Rob (and the other members of the team) safe – looking out for the early signs of hypothermia and frostbite. The expedition involves a great deal of medical research so there will be daily tests to do and data to collect. The expedition is also hoping to raise £250,000.00 to fund a UK Burn Support Network (UBSN) which currently does not exist. Here’s an interesting look at what Rob will need to endure to is skin grafts during his epic trek to the South Pole – But is in safe hands with team Doctor Greg Williams. The aim of this network will be to signpost burn survivors to the various support services available throughout the UK within the public and private sectors for physical, psychological, therapy, financial, legal, welfare and peer support. Many of these resources function independently and in isolation, so it is difficult for burn survivors to learn about them or know how to access them. The project will also aim to identify and fill the gaps in burn survivor peer support. 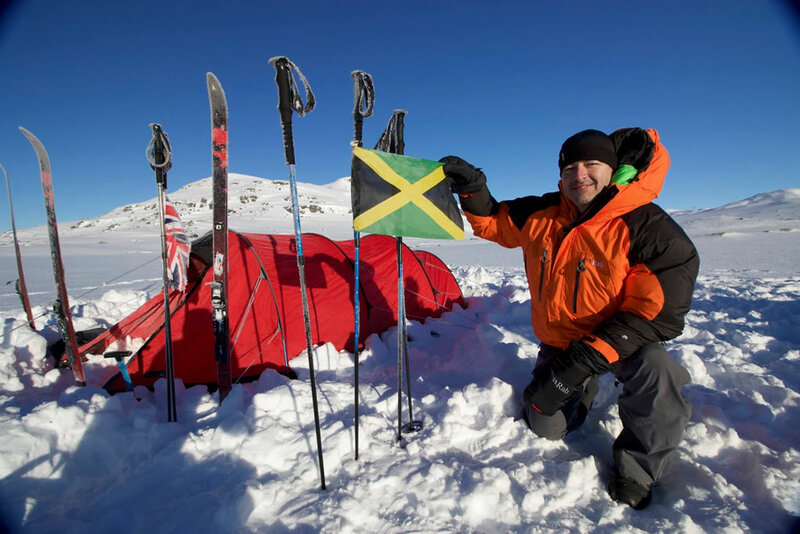 I am excited on several levels –- walking to the South Pole will undoubtedly be an epic experience and to be the first Jamaican to do so will be a very proud moment. But I am also excited about the difference that the UBSN can make in the shattered lives of burn survivors, and I hope we can raise the target figure we have set ourselves. Many of these resources function independently and in isolation, so it is difficult for burn survivors to learn about them or know how to access them. The project will also aim to identify and fill the gaps in burn survivor peer support. 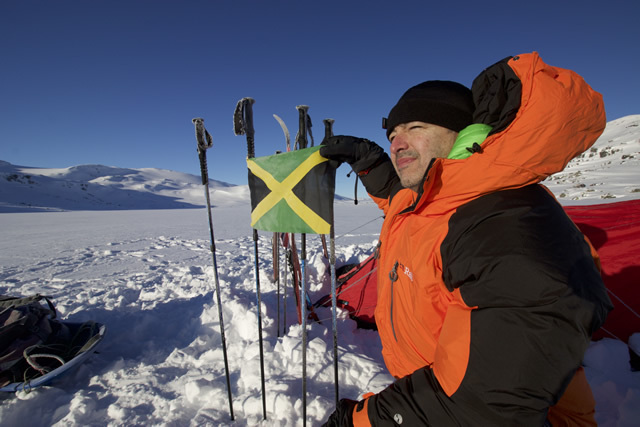 I am excited on several levels –- walking to the South Pole will undoubtedly be an epic experience and to be the first Jamaican to do so will be a very proud moment. But I am also excited about the difference that the UBSN can make in the shattered lives of burn survivors, and I hope we can raise the target figure we have set ourselves. What type of training have you done (or will have to) complete to prepare and participate in the expedition? The FFTI team needs to learn how to function as a tight, cohesive unit in order to survive in the freezing environment of Antarctica especially when setting up camp on a daily basis when mistakes could cost lives. Remember Antarctica is the coldest, windiest, highest and driest continent on earth. Obviously, we need to be physically fit in order to be able to ski for hours on end across the polar ice in these conditions so gym preparation is essential. We also need to be mentally prepared so spending time together in stressful situations is an important part of team building. Why did the team choose Finse, Norway to do the expedition training? Finse, Norway was the location the FFTI team chose to do its expedition training because it is Europe’s southernmost polar environment. It is also the location that 100 years ago, Sir Ernest Shackleton the famous British polar explorer chose to do his training and test his equipment before heading to Antarctica. Fitness training, sponsorship meetings, lecture commitments and team building exercises are part of the trajectory to December 2016. We have another team training exercise planned for September which will probably take place in the Scottish Highlands. When we head to Punta Arenas, Chile we will do final training and then head to Union Glacier, Antarctica to acclimatise. Where can we (fans) find you on social media?